The Aquaco Residential Grey Water Recycling System involves the collection of bath and shower water which is then filtered, disinfected and recycled with our grey water treatment for the use of toilet flushing. Aquaco residential water treatment systems have been installed in homes on new estates and retrofitted to individual homes throughout the UK. 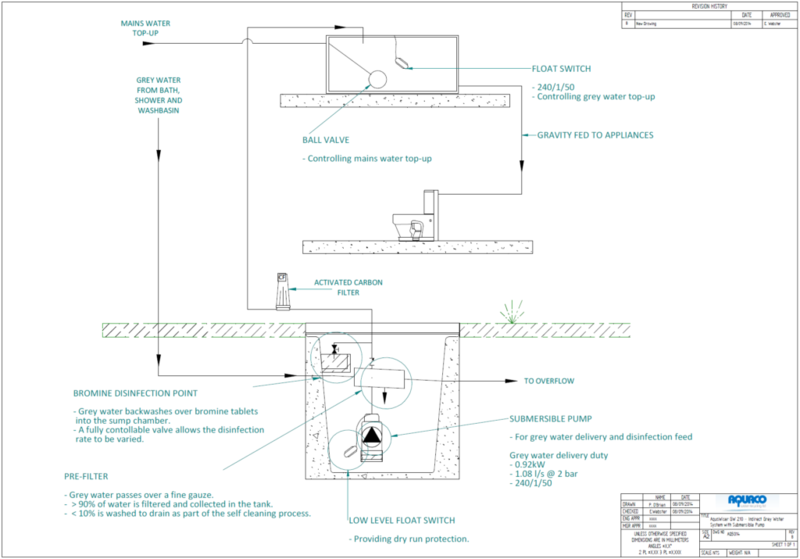 Any residential home project should include Aquaco Greywater systems. Enhanced Capital Allowance (ECA) scheme available. Cost effective compared to rainwater harvesting. Daily supply per person roughly equates to demand – no reliance on rainfall. Storage capacity needed will be less than with a rainwater harvesting system, saving space and cost. As the rules on BREEAM points and tax allowances change, Aquaco cannot advise directly and it is for the customer to verify the present rules as they affect the project concerned. However, Aquaco are happy to provide all system calculations used in order to expedite any applications being made. The Aquaco Aquawiser™ complete grey water system provides all you need to supply your home with water for toilet flushing. Many systems are operating successfully in homes across the UK. The Aquawiser GW 210 recycles shower, bath and hand basin discharge water for re-use in flushing toilets. Small footprint and low cost compared to rainwater harvesting systems. Consistent supply to match demand – not reliant on rainfall. Water is collected from the wash hand basins, showers and baths, via a separate dedicated grey water stack. This means that unless major refurbishment is happening on the property, Aquaco residential grey water systems are best suited to new build properties. The grey water stack then goes underground into normal DN100 soil pipe and connected into the pre-built underground Aquawiser tank grey water inlet. The water enters the tank into the pre-filter. The pre-filter removes any hair and large particulates from the grey water preventing it from entering in to the tank chamber, excess water and particulates are passed to drain via the Aquawiser tank overflow. Once the water in in the tank chamber it is disinfected using the bromine disinfection chamber, which circulates a portion of the water over bromine tablets, disinfecting the water ready for final filtration and use. The tank contains a pump which is used to pump water to the roof header tank. Prior to entering the header tank the water passes through an activated carbon filter, which removes discolouration, particulates and excess bromine. Water then distributed to the point-of-use via gravity from the header tank. In the even that there is insufficient treated grey water available, a mechanical ball valve in the header tank will automatically top-up the system with mains water via a Category 5, type AB air gap, providing full continuity of supply. Submersible pump with integral low level float switch. 15mm float valve for mains top up. 3/4 inch inlet connection for grey water. 1 1/4 inch inlet connection for overflow. Differential float switch for control of the pump in the sump tank. Inline activated carbon cartridge filter and assembly. 20 inch cartridge filter housing. 2 no. Activated carbon inserts. The System is also available in a “direct” variant, which allows for the system to be installed without a header tank. Please fill out a Quick Quote form for more information.